Some time in the 80's a couple of friends and I decided to go on a cycling, youth hosteling holiday in Kent. We picked Kent because we thought it would be flat; we didn't factor in the wind. Anyways, the details are now greatly muddied by time, but somewhere along the way we encountered a hostel manager selling this camera. I already had a few folders bought for cheap and, even though I'd never heard of Steky, I instantly wanted the IIIA to be the jewel of my collection. The seller wanted 20 pounds - not an insignificant amount of cash to me back in those days. As I didn't have the money with me I had to send him a check once I got back home. 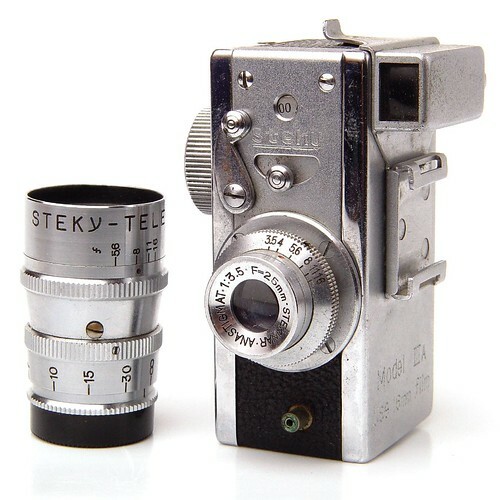 By return mail came the Steky IIIA with its two lenses and leather cases for everything. At the time that I bought it I had intended to use the Steky but rolling 16mm film into tiny, fiddly cartridges in the dark room was beyond me. Today, I don't really see the attraction of sub-mini cameras as users although they do have a cult following of enthusiastic users. I doubt, therefore, that I'll ever really use this camera but I still love having it around. It's beauiltifully built, an engineering jewel, and just amazing that they managed to fit so many features into such a tiny package. All content © 2003-2011 the other Martin Taylor.